We have all heard about our body clock – also known as the circadian rhythm – the internal 24-hour clock which powers the daily cycles and changes in body temperature, hormone production, metabolism and even brain activity. New research findings have prompted scientists to believe that this body clock can play a vital role in the ageing process as well. 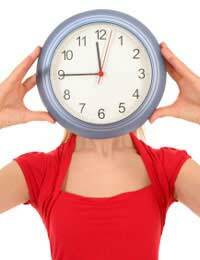 It has long been observed that disruption of the body clock can have significant effects on health and well-being. You only need to ask anyone who has returned from an overseas trip, with long plane journeys and jet lag, how dreadful they feel and how much the change has affected their sleep, appetite, digestion and even immune systems! Other health problems that can arise from disturbances of your body clock include Seasonal Affective Disorder (SAD) and Delayed Sleep Phase Syndrome (DSPS). Doctors have also found that by timing medical treatments to coordinate with the body clock can significantly increase the efficacy of drugs or even reduce the toxicity of certain drugs or intensity of certain adverse reactions. Long term disruption of the body clock is believed to play a significant role in the development or even exacerbation of cardiovascular disease. Disrupting the body clock also suppresses melatonin production and this has been associated with an increased risk of developing cancer. Given all these effects and influences that the body clock has on important body functions, it is hardly surprising that the body clock should play a role in the ageing process too. Researches at the Washington University School of Medicine and the Northwestern University in the United states have discovered how the mechanism of the biological body clock communicates with the internal processes which regulate our metabolism and ageing. In particular, they found clear links between the body clock and a gene named SIRT1 which plays a central role in the network that governs ageing. SIRT1 coordinates metabolic processes throughout the body and manages your response to nutrition, affecting everything from glucose production and breakdown to cholesterol metabolism to insulin sensitivity to fat burning. Therefore, it is easy to see why the waning of the body clock which comes with age can contribute to age-related illnesses, such as type 2 diabetes and insulin resistance. In addition to coordinating and managing the overall metabolic processes, many believe that your body clock is also involved in coordinating a repair and maintenance schedule for individual organs across the body. For example, it is believed that the lungs and respiratory tract are one of the organs scheduled for repair at the start of the day – possibly why many people experience congestion first thing in the morning. Similarly, it is believed that the large intestine or colon is also given its “daily check and repair” early in the morning. And since a healthy colon needs sufficient amounts of water to function properly and flush out all toxins, it is believed that having caffeine first thing in the morning is actually detrimental as its diuretic effects remove the water necessary for proper colon function. Many people follow the practice of starting the day with a glass of water, as this is believed to help your colon – and kidneys and bladder – evacuate waste, leading to better digestion, weight maintenance and ultimately, slowing down the ageing process. Another important organ up for maintenance is the heart, which is believed to be “in repairs” around midday and many believe it is no coincidence that a large percentage of heart attacks occur during this period. The liver is another important organ which has a slot in the body clock’s maintenance schedule – in this case, late at night and into the early hours of the morning. Therefore, it is believed that many cases of insomnia may due to poor processing of waste by the liver during this time. While you may not necessarily need to know the details of your body clock and how it regulates the maintenance of each organ, having an awareness of your own body clock and paying attention to it – and to any correlations in discomfort, pain or other problems during specific times – may give you useful information for maintaining your health and ultimately slowing the ageing process.